"My name is Cordelia... not like that means anything. I’m not the interesting part of this story. No one has any reason to invest in me as a character. I’m ill-defined and incidental. This entire thing: it’s never been about me. It’s always been about her." Cordelia has a twin sister. That is to say, she used to. Maybe she still does. No one’s too sure exactly where Annabel is now. But at least – alive or dead – she hasn’t been forgotten. Since Annabel’s abduction, aged six, Cordelia has come to learn that there are other ways of vanishing besides simply disappearing. Overlooked by her own traumatised parents, patronised by police investigators and marginalised by teachers and former friends, growing up in the long, dark shadow of her absent sister, Cordelia realises that she has simply become “the other one”. A sophisticated, suspenseful and bleakly humorous story of prodigies and prodigals, of love and loss and all their attendant human folly. "I read this book in one night, couldn't put it down. Suspenseful and very well written. Quite possibly my favorite book from Nico so far. This filled my macabre heart, kept me fully engaged and even had me laughing at times. You won't regret reading this. Highly recommend." "I just devoured this short story. I found it superbly well written start to finish and impossible to put down. It achieved something I'm not used to with books: Normally when a book is done, I just want to read more about the characters and look at their lives more. But with how this one ended, any further look into the characters would have completely ruined the impact of the story. It was one of the most satisfyingly whole stories I've ever read." "Enjoyed from start to finish and once I started I didn't want to stop until I had read it all. And the ending was absolutely not what I expected. Good read." "An intriguing story and so well written. Nico is incredibly talented. I recommend all her books!" "A story of a missing girl, but written from the perspetive of her sister, her twin. This short story gives a very different look into what families, especially a sibling might go through when experiencing a tragedy. With twists and turns along the way, this short tale feels like so much more than a quick read and is well worth your time." "A really good but disturbing short story. It certainly held my interest till the end." "A fantastic short story by a very talented author. I was gripped and intrigued from the very start, The Other One is a real page turner. I read the whole story in one sitting and was thoroughly entertained throughout. Cordelia had a twin sister, Annabel, since she disappeared Cordelia realised that she was no longer the important one, she was just "The Other One". Clever, thoughtful and well constructed this is another great story from Nico Reznick the author of Anhedonia. I don't want to reveal too much about the tale, read it yourself, I don't think you'll be disappointed." "Regular blog visitors will already know that I am a big fan of Nico Reznick's writing. This is my third five star review for her work with the others being for her poetry collection Gulag 101 and her novel Anhedonia. The Other One is short and sharp and I am finding it difficult to write about without giving away anything important. I definitely appreciated discovering and unravelling its mysteries for myself so don't want to reduce that enjoyment for anyone else! Reznick's narrator, Cordelia, is a great character - bitter in her isolation, but without being overly self-pitying - and, despite her sixteen years, makes acute observations on the world as it appears to her and the factors which influence peoples' relationships with each other. 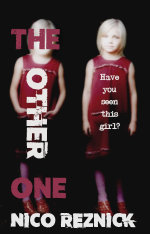 The Other One is a particularly chilling novella and I loved how Reznick slowly ramps up the unease and, although I had by then sort of worked out what had happened, the truth of the ending was an expertly timed shock." "A great read - very different and thought provoking."